In film, objects, or design fragments, or props, or accessories (call them what you will) are thematic pointers: they conceal and reveal, simplify and stylise, function as expressive detail, focus the spectator’s gaze, or simply just look good. When reading film critic Scott Jordan Harris’s new book, I began thinking of those objects that seemed to dominate the films in which they were found: Fred Astaire dancing with a hat-stand in Royal Wedding (1951) or Marion Crane’s stolen $40,000 wrapped in a newspaper in Psycho (1960). Thinking about it, perhaps my own love affair with French cinema might have been kick started by the role of objects – a teddy bear with one sad eye and one happy eye in Marcel Carné’s Le Jour se lève (1939), or Antoine Doinel and the typewriter jammed under one arm in Les Quatre cent coups (1959). As the camera lingers over these objects, their importance is often increased: something anonymous in the background may well just be a means of establishing part of the whole, but when isolated in close up, or subjected to rhythmic editing, it can operate as discreet mirror of character and milieu or be charged with significance. These supporting players, far from being neutral or inconsequential components of the mise en scene, become rich repositories of meaning. 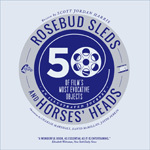 In Rosebud Sleds and Horses’ Heads: 50 of Film’s Most Evocative Objects, Harris takes the reader on a fascinating journey through cinema history, pointing out the most significant objects, explaining their worth, and, in some cases, arguing that the very meaning or impact of the film can be traced back to that one ‘thing’. They are, he argues, “not just objects but objectives, pursued by both heroes and villains” (5). The objects are subdivided – maybe it’s an item of clothing, or an ornament, or a mode of transport – which allows for a more wide-ranging analysis of the terrain than if Harris had just focused on, say, guns and gadgets. His choices range from the predictable – Dorothy’s ruby slippers in The Wizard of Oz (1939), Monroe’s dress in The Seven Year Itch (1955), that pesky ring in Peter Jackson’s never-ending hobbits and dwarves epic – to the downright quaint and quirky (Back to the Future II’s  flying hover board, Kermit’s bike in The Muppet Movie , and so on). If you’re looking at that list and thinking ‘How very Hollywood’, then you’d be right. It’s a shame that only a few non-American film objects are namechecked. It’s great to see Harris write vividly about the ‘cosmic cup of coffee’ in Godard’s Two or Three Things I Know About Her (“the cup is evocative of all the secrets of the universe and represents a new method of cinematic inquiry into them”, 44), but I would have liked more examples of how other national cinemas have treated objects. It’s a little bottom-heavy too: the first fifty years of cinema are condensed into the first ten objects (slippers, sleds, Maltese falcons, inflatable globes), while the last twenty-five objects date from 1974. That’s not necessarily a problem – Harris’s seems to suggest that as Hollywood’s art departments and production designers have become ever more sophisticated, able to conjure up entire worlds on a computer screen, it is the presence of a simple, tangible object that can lend a film heft. What’s more, many of these later objects resemble the classic Hitchcock Macguffin – Pulp Fiction’s (1994) briefcase, the typewriter in Delirious (1991), and so on. Perhaps Harris is slyly commenting on modern cinema’s increasingly lack of faith in talk, in dialogue, in non-contrivance. It is the objects themselves that frequently drive the films he discusses – the coloured pills in The Matrix (1999), the coke bottle in The Gods Must Be Crazy (1980) – and become integral characters. Harris writes with enthusiasm and wit, and inflects his entries with autobiographical snippets and ‘I remember when’ memories. There’s sometimes a little too much zeal: the wafer-thin mint in Monty Python’s The Meaning of Life (1997) is “one of cinema’s most memorable objects” (78), or the plastic bag in American Beauty(1999) is “Hollywood’s standout symbol of the traces of the sublime” (98), but by and large, this is a clear-sighted and well-written book. Harris is ably supported by three UK-based illustrators, whose sketchings and drawings accompany each of the objects. Part of the pleasure of the book is looking at the image before reading about the object, and guessing which film Harris will be referring to – a severed horse’s head and a man in red-and-white striped pyjamas, for instances, instantly cues up The Godfather (1972). These coloured drawings also conjure up the nostalgia attached to the objects for Harris far better than the reproduction of stills or screengrabs; their lo-fi quality perfectly suits the book’s focus on objects as personal memories, and lends a subtle dreaminess to Harris’s analysis. Overall, then, this has much to recommend it: ‘Best Of’ lists will always be subjective, and often infuriating, but in this case, Harris reminds us that film objects, like the score, the star, or the set design, can come to encapsulate what is it about a particular film that is captivating, thought-provoking, or, in the case of the Batmobile in Batman Begins (2005), just cool.